LIMITED QUANTITY! While supplies last! Black-tone face and Metal Chain (19.75 inches/25 mm) and organza pouch included. 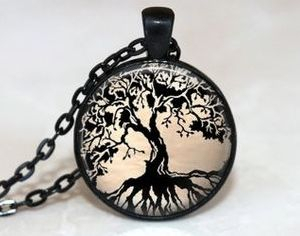 DESCRIPTION: This pendant made of glass and metal features a beautifully designed black Tree of Life. Its mystic aspect will provide a sense of peace and bring you in a state of reverie. SYMBOL: The tree of Life is the structure on which the universe is built. It explains the immutable laws of Nature. Silver-tone face and Metal Chain (19.75 inches/25 mm) and organza pouch included.